One of my favourite venues, all year round, is Elms Barn – the Barn itself is warm & welcoming and the grounds are fabulous no matter the time of year. Verity & Val got married on an overcast Easter weekend Saturday – I know I do go on about the weather, but as a Norfolk wedding photographer, I need to be prepared for whatever it throws at us, so I was pleased I didn’t have to break out the full rainy day equipment and emergency plastic bags! 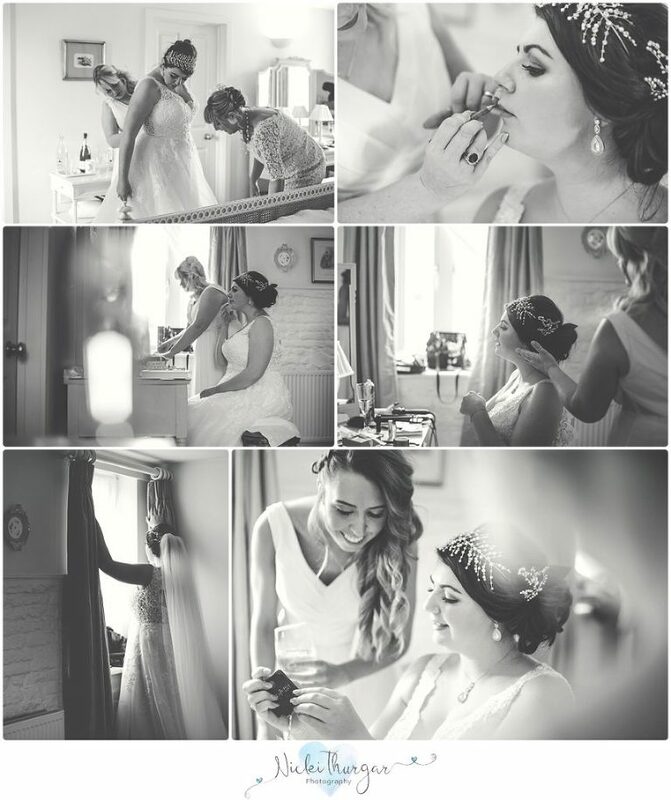 The bride & her bridesmaids got ready at Stackyard Lodge, where their make up was artfully applied by Sarah Patterson, a close friend of the bride, and also one of the bridesmaids – whilst Val got ready at home. The colour theme for the day was spring yellow, and so much thought had gone into all the details for the day – there were some beautiful daffodil lights adorning the ceremony room and the bridesmaid’s dresses (seven of them, plus a flower girl!) were a subtle, stunning shade of yellow – just beautiful, as were the flowers, which matched the dresses perfectly. Verity was driven the short distance from the house to the ceremony in a Bentley. The ceremony room was decorated with flowers and fairy lights and was packed with around 100 guests – a couple of close friends did readings during the ceremony, which went without a hitch. After the ceremony, we headed outside for the confetti throw – yellow and white hearts that Verity had mixed herself – and it absolutely showered down on the newly weds! Next were some family and friend photos, followed by a stroll into the gardens and wooded area of Elms Barn to get some “signature” couple photos – Verity wore some fantastic bright yellow wellies for this session, and we managed to nicely colour match some daffodils with the wellies! Back inside to the welcoming and warm barn, where guests enjoyed a roast dinner, followed by the speeches. These brought a tear to everyone’s eyes – especially when Verity’s dad was overcome with emotion and had to hand his speech over for her brother to read – the encouragement he got from the guests when he faltered was heartwarming! Finally, after a seamless first dance, the guests enjoyed music from The Fuzz and everyone was quickly up on the dance floor to fill it and dance the night away! I’ve been looking forward to this wedding for a long time, after a fun engagement session at Eaton Park with Verity & Val, and it was just as fun and enjoyable as I knew it would be with this lovely couple and their wonderful friends and family. Thanks V & V for having me – enjoy this small peek at the big day!